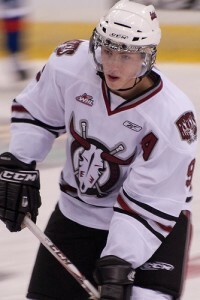 My latest at The Hockey Writers - Ryan Nugent-Hopkins detailed profile. The premiere playmaking forward in the draft passes the puck like the Green Bay Packers Aaron Rodgers throws the pigskin – almost pure perfection. RNH possesses a tantalizing combination – tremendous offensive skill-set, defensive awareness and great character. A speedy skater and an accurate shot to go with, “Hoppy” will earn the majority of his future NHL paycheck with his outstanding vision, exceptional playmaking ability and slick puck-handling skills.